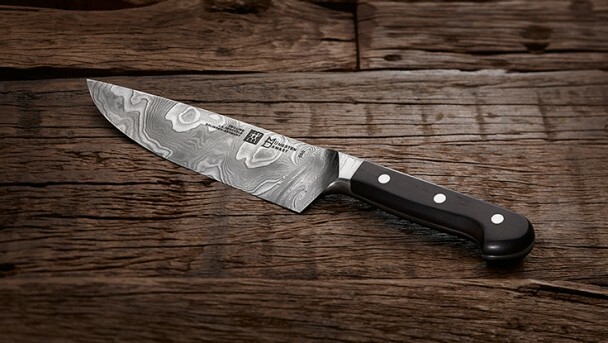 History combines with modernity in the unique ZWILLING® MÜNGSTEN DAMASK knife. Using steel from Germany's highest bridge, the Mungsten bridge, each knife has 107 layers of steel. Created especially to celebrate ZWILLING's 285th year. Consisting of 107 layers. Made from the steel from the Mungsten bridge and created leaving a damask pattern, unique to each knife. Made from black wood, the 3 rivet design with full tang ensures a well balanced, elegant knife. The smooth bolster ensures a sleek transition from blade to handle. The curved bolster allows the 'pinch grip' for safe and precise cutting. 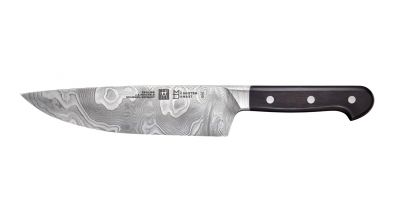 With its V-edge, ZWILLING sets the standard in kitchen knives. The 30 degree angle created, 15 degrees on each side, gives the optimum cutting angle for optimal performence. The blade glides effortlessly through the material being cut. With its 107 metres, the Mungsten Bridge between Solingen and Wuppertal is the highest railway bridge in Germany. 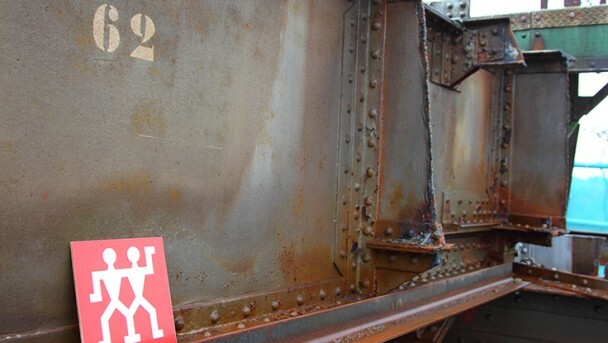 In addition, due to its unusual design, it is considered as an unprecedented engineering feat. With its elegant arches, it is considered one of the most beautiful industrial monuments in the country.